With the snow finally melting from the ground this past week – and the thermometer rising above the 50 degree mark for the first time in months – it’s FINALLY time to start getting serious about the garden! For us, that means getting ready to start all of our vegetable seeds indoors, and more importantly, timing the process so that our plants are ready for the big garden at the right time. For many of the typical vegetable plants (i.e. tomatoes, peppers, cucumbers, etc.) 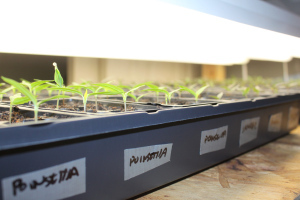 – a good rule of thumb is to start seeds indoors about 6 to 8 weeks before your projected outdoor planting day.